Employees are increasingly mobile across state lines. This is partly the result of technological change that facilitates individual movement and communication, but also a result of corresponding changes in corporate organization to establish offices and interests in multiple jurisdictions. With these developments, there has been a rise in litigation surrounding the enforcement of employee covenants not to compete when the parties or issues involved have connections to multiple jurisdictions. The emerging body of law intrigues and confounds lawyers and commentators because of its complexity and unpredictability. 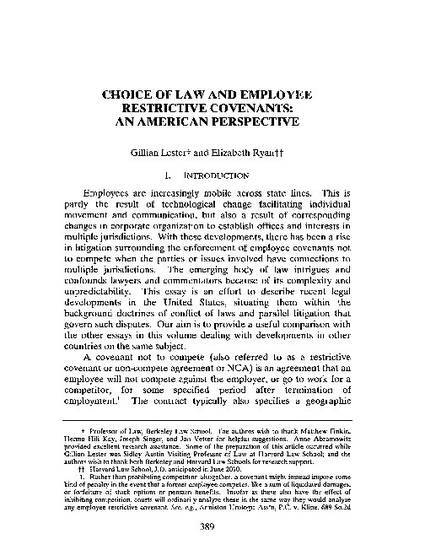 This essay is an effort to describe recent legal developments in the United States, situating them within the background doctrines of conflict of laws and parallel litigation that govern such disputes.